Launched on the market during the last Ipack-Ima in Milan, the new Semolina HP55 is is enjoying success and getting approvals from the millers who have chosen it. Installed in the new, higher performance mills, it is demonstrating that the architecture and distinctive features of this new version allow for greater effectiveness and renewed performance. 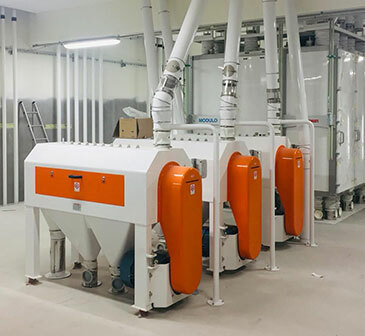 By configuring the purifier to have four rows of superimposed sieves, each composed of three sieves, the separation efficiency of the semolina is considerably more precise. Furthermore, the purification surface of the HP55 has been increased by 10% due to utilizing 550mm square sieves. Despite the increase of the sifting surface, the newly designed configuration of the sieves allowed the overall footprint of the machine to be reduced by 12%. In addition to saving valuable floor space within the mill, the reduction in size contributed to reducing the energy requirement for the eccentric movement of the machine. Given the different internal distribution of the sieves and the reduction in machine length, the air flow distribution is much more uniform and more easily controlled across the length of the machine. To maximize the purification efficiency of the semolina, there are four air-flow adjustment points per sieve length on the Semolina HP55 which enables the miller to precisely control the air flow and maximize the performance based on the current mill operating conditions. This allows for an exceptionally high degree of accuracy when purifying the semolina. With Semolina HP55 Golfetto Sangati marks another important step in the evolution of milling technologies.